In this study, it is investigated the psychological effects of yoga on adult’s mood such as stress, anxiety and depression. Depression, Anxiety and Stress Scale (DASS) with 42 items (Lovibond and Lovibond, 1995) was used for collecting data in two times: Pre-test and Post-test. This scale administered in 95 subjects in Middle East Technical University in Ankara/Turkey. For data analysis, SPSS version 21 and a paired sample T-test were used. The results indicated that there was a significant difference between stress, anxiety and depression scores before and after two weeks yoga exercise treatment. Yoga has a positive effect on person’s psychological mood and it may decrease the stress, anxiety and depression disorders. Acuna, C., Bolis, M. (2005). Stigmatization and access to health care in Latin America: Challenges and perspectives. In Trabajopresentado en el XXIX Congress of the International Academy of Law and Mental Health, del (Vol. 4). Akın, A., Abacı, R., Çetin, B. (2007).The validity and reliability of the Turkish version of the metacognitive awareness inventory. Educational Sciences: Theory & Practice, 7(2), 671- 678. Bilgel, N., Bayram, N. (2010). Turkish Version of the Depression Anxiety Stress Scale (DASS-42): Psychometric Properties. Archives of Neuropsychiatry/Noropsikiatri Arsivi, 47(2). Byrne, D. G., Espnes, G. A. (2008). Occupational stress and cardiovascular disease. Stress and Health, 24(3), 231-238. Crawford, J. R., Henry, J. D. (2003). The Depression Anxiety Stress Scales (DASS): Normative data and latent structure in a large non‐clinical sample. British Journal of Clinical Psychology, 42(2), 111-131. Cruess, D. G., Antoni, M. H., McGregor, B. A., Kilbourn, K. M., Boyers, A. E., Alferi, S. M., ... Kumar, M. (2000). Cognitive-behavioral stress management reduces serum cortisol by enhancing benefit finding among women being treated for early stage breast cancer. Psychosomatic Medicine, 62(3), 304-308. Daley, A. J. (2002). Exercise therapy and mental health in clinical populations: is exercise therapy a worthwhile intervention? Advances in Psychiatric Treatment, 8(4), 262-270. Devereux, R. B., Pickering, T. G., Harshfield, G. A., Kleinert, H. D., Denby, Lorraine, E., Clark, L., ... Laragh, J. H. (1983). Left ventricular hypertrophy in patients with hypertension: importance of blood pressure response to regularly recurring stress. Circulation, 68(3), 470-476. Field, T., Diego, M., Hernandez-Reif, M., Medina, L., Delgado, J., Hernandez, A. (2012). Yoga and massage therapy reduce prenatal depression and prematurity. Journal of Bodywork and Movement Therapies, 16(2), 204-209. Gupta, N., Khera, S., Vempati, R. P., Sharma, R., Bijlani, R. L. (2006). Effect of yoga based lifestyle intervention on state and trait anxiety. Indian Journal of Physiology and Pharmacology, 50(1), 41. Granath, J., Ingvarsson, S., von Thiele, U., Lundberg, U. (2006). Stress management: a randomized study of cognitive behavioural therapy and yoga. Cognitive Behaviour Therapy, 35(1), 3-10. Iyengar, B. K. S. (1979). Light on yoga. New York: Schocken Books. Khalsa, S. B. S., Shorter, S. M., Cope, S., Wyshak, G., Sklar, E. (2009). Yoga ameliorates performance anxiety and mood disturbance in young professional musicians. Applied Psychophysiology and Biofeedback, 34(4), 279-289. Herrick, C. M., Ainsworth, A. D. (2000). Invest in Yourself: Yoga as a Self‐Care Strategy. In nursing forum (Vol. 35, No. 2, pp. 32-36). Blackwell Publishing Ltd.
Ironson, G., Antoni, M., Schneiderman, N., LaPerriere, A., Klimas, N., Lutgendorf, S. K., Fletcher, M. A. (2000). Stress management and psychosocial predictors of disease course in HIV-1 infection. Washington DC: American Psychiatric Press. Javnbakht, M., HejaziKenari, R.,Ghasemi, M. (2009).Effects of yoga on depression and anxiety of women. Complementary Therapies in Clinical Practice, 15(2), 102-104. Lovibond, S.H., Lovibond, P.F. (1995). Manual for the Depression anxiety Stress Scales. (2nd Ed) Sydney: Psychology Foundation. Macy, D. (2013). “Yoga in America” market study. Yoga Journal. Available: http://www. yogajournal.com/advertise/press_ releases/10.Accessed, 20. Netz, Y., Lidor, R. (2003). Mood alterations in mindful versus aerobic exercise modes. The Journal of Psychology, 137(5), 405-419. Pickering, T. G. (2001). Mental stress as a causal factor in the development of hypertension and cardiovascular disease. Current Hypertension Reports, 3(3), 249-254. Ray, U. S., Mukhopadhyaya, S., Purkayastha, S. S., Asnani, V., Tomer, O. S., Prashad, R., ...Selvamurthy, W. (2001). Effect of yogic exercises on physical and mental health of young fellowship course trainees. Indian Journal of Physiology and Pharmacology, 45(1), 37-53. Sahsi G, Mohan D, Kacker C. (1989). Effectiveness of yogic techniques in the management of anxiety. Journal of Personality Clinical Studies, 5, 51–5. Satyapriya, M., Nagendra, H. R., Nagarathna, R.,Padmalatha, V. (2009). Effect of integrated yoga on stress and heart rate variability in pregnant women. International Journal of Gynecology & Obstetrics, 104(3), 218-222. Shephard, R. J. (1997). Aging, physical activity, and health. Human Kinetics Publishers. Smith, C., Hancock, H., Blake-Mortimer, J., Eckert, K. (2007). A randomised comparative trial of yoga and relaxation to reduce stress and anxiety. Complementary Therapies in Medicine, 15(2), 77-83. Taspinar, B., Aslan, U. B., Ağbuğa, B.,Taspinar, F. (2014). A comparison of the effects of hatha yoga and resistance exercise on mental health and well-being in sedentary adults: A pilot study. Complementary Therapies in Medicine, 22(3), 433-440. Thayer, R. E. (2001). Calm energy-How people regulate mood with food and exercise. Oxford: Oxford University Press. Waelde, L. C., Thompson, L., Gallagher‐Thompson, D. (2004). A pilot study of a yoga and meditation intervention for dementia caregiver stress. Journal of Clinical Psychology, 60(6), 677-687. Yurtkuran, M., Alp, A., Yurtkuran, M., Dilek, K. (2007). A modified yoga-based exercise program in hemodialysis patients: a randomized controlled study. Complementary Therapies in Medicine, 15(3), 164-171. Ülger, Ö., Yağlı, N. V. (2010). Effects of yoga on the quality of life in cancer patients. Complementary Therapies in Clinical Practice, 16(2), 60-63. ISNAD Mehrtash, Shabnam , Koçak, Settar , Hürmeriç Altunsöz, Irmak . "The Effect of Yoga on Stress, Anxiety and Depression among Turkish Adults: A preliminary study". 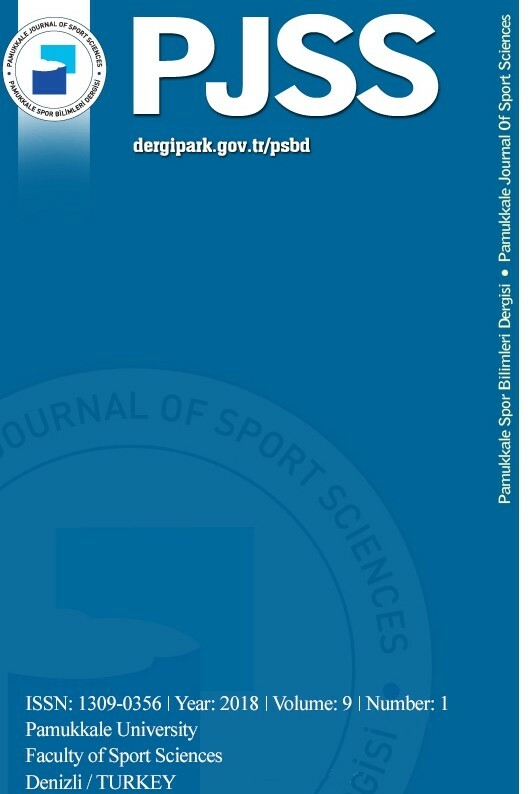 Pamukkale Journal of Sport Sciences 6 / 1 (January 2015): 39-49.